The immediate Southern Maryland area has three different US Navy bases, and on March 13, 2018, The Patuxent Partnership is sponsoring an event that aims to bring those three bases closer together in Collaboration. 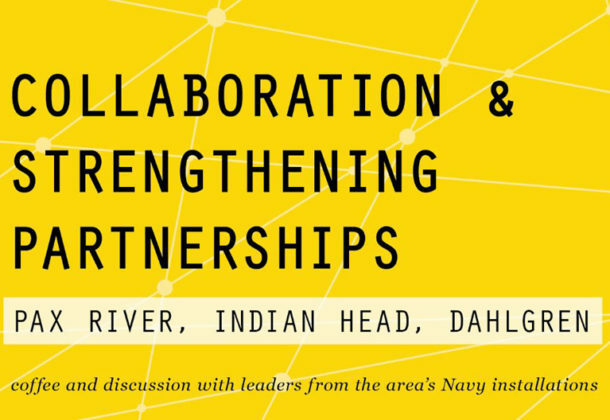 The event “Collaboration & Strengthening Partnerships: Pax River, Indian Head, Dahlgren,” will be held that Tuesday from 8 to 9:30 am at the Southern Maryland Higher Education Center, Center Hall, Building 2, 44219 Airport Road, California, MD 20619. The region’s Navy bases have become enormous economic engines in each of their locations, as they employ thousands of people. This means those people are entrenched in the communities in which their families live, their children attend school, and they do the majority of their shopping and entertainment. In addition to their importance to their communities, the bases offer major services to the Navy and US government. Collaboration among them only makes sense. Three speakers are being invited to collaborate at the event, one from each base. First is Ashley Johnson, SES, technical director of the Naval Surface Warfare Center Indian Head Explosive Ordnance Disposal Technology Division. The next is Dale Sisson, SSTM, deputy technical director for the Naval Surface Warfare Center, Dahlgren Division, just across the Gov. Harry W. Nice Memorial Bridge in Virginia. The final speaker is Leslie Taylor, SES, executive director, NAWCAD; deputy assistant commander for test and evaluation, NAVAIR, in St. Mary’s County. Check-in for the event and coffee begins at 7:30 am. Attendees from acquisition workforce can earn two CL points. Those attendees should be logged manually into eDACM on this website. There is no cost to attend the program, but advanced registration is requested to help ensure there is enough coffee and seating. For information on the Southern Maryland Higher Education Center, the location for many TPP events in St. Mary’s County, visit its website.